Storage: keep refrigerated and best eaten at room temperature. 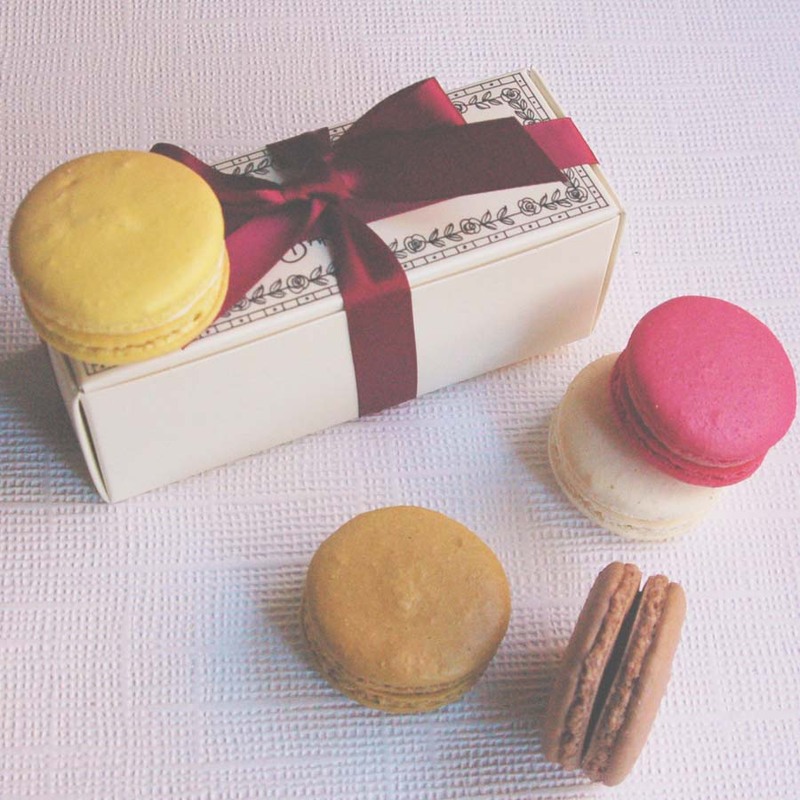 These macarons are handmade using free-range eggs, the finest local ingredients and are gluten free. Delivery is included via Royal Mail 1st class service who aim to deliver the next working day but it's not a guaranteed service. Please make sure somebody is able to sign for your parcel. Orders placed on Thursday or Friday will be dispatched the following Monday as we don't dispatch on Fridays. Macaron: 4cm in diameter, Box: 5cmx13.3cmx5cm, 150g. Salted Caramel: Free-range (egg) whites, caster sugar, ground almonds (nuts), icing sugar, salted butter, (milk), double cream (milk), cocoa powder. Raspberry: Free-range (egg) whites, caster sugar, ground almonds (nuts), icing sugar, butter (milk) , freeze-dried raspberries raspberry jam (raspberry, glucose-fructose syrup, acidity regulators, sodium citrate, citric acid, gelling agent (pectin) Pink food colouring. Lemon: Free-range (egg) whites, caster sugar, ground almonds (nuts), icing sugar, butter (milk), lemon curd (glucose-fructose syrup, sugar, water, lemon juice from concentrate, margerine, maize starch, dried whole egg, citric acid, gelling agent, pectin, sodium citrates, colours: lutein, beta-carotene: lemon oil, ascorbic acid) Yellow food colouring. Contains nuts, eggs and milk. Produced in a bakery that handles nuts, milk, soy, wheat products and fish.